Click here to read all my MTVW posts. “The uncertainty surrounding Brexit of which I wrote last year will continue until 29 March 2019 at the earliest. Whilst the Company conducts its business entirely within the borders of the United Kingdom, it cannot escape the overall effect of these uncertainties. I am hopeful the £283k average selling price means MTVW is not too exposed to any elevated property valuations. 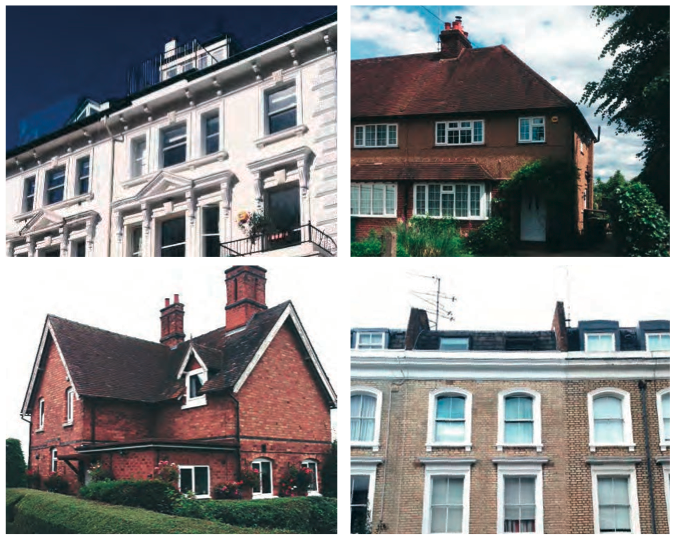 During the last 18 months, the firm has sold 243 properties of which only 4 have achieved prices of more than £1m. Clearly MTVW is no longer making as much profit from its property sales — or is selling as many properties — as it once was. For some perspective, this H1’s 57% gross margin is equivalent to MTVW selling a property for a 133% gain. During the last ten years, the group has reported gains ranging from 76% to 201% — and has enjoyed a 156% average. As a reminder, MTVW’s style of property trading can lead to haphazard earnings. The firm’s portfolio is dominated by 2,000 or so regulated-tenancy (or similar) properties, and the number of these homes becoming available for sale — and the proceeds they generate — can be unpredictable. You see, the properties are sold only when the regulated tenancy ends — which most often occurs when the tenant dies. Furthermore, the gain on each property sold — typically correlated to how long the property has been owned by MTVW — can vary somewhat. As such, if the properties sold were bought relatively recently, then the resultant gross margin would be much lower than if the properties had been owned for decades. Although MTVW’s H1 progress was not spectacular, the performance did add a further £5m to the balance sheet to propel net asset value (NAV) to a fresh £360m/£92 per share peak. Some £9m was spent acquiring 27 additional properties during the six months (average cost: £342k), which MTVW described as “good purchases”. A £10m debt repayment plus an £8m dividend left net debt £3m lighter at £42m. Net debt currently represents 11% of the group’s £378m property stock. 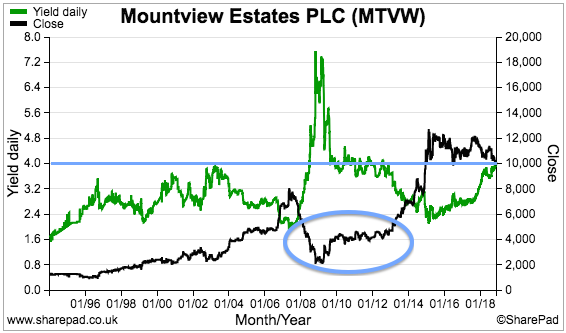 In the past, this ratio has often topped 30% and suggests MTVW could have the capacity to borrow another £70m. A similar story occurred last year when a different non-exec was not re-elected at the annual meeting. Just like this year, a general meeting was then convened, and that non-exec was eventually appointed as well after the major Sinclair family shareholders had their vote. I see the 2018 dissident vote increased by approximately 100,000 shares on 2017. Those extra votes equate to a £10m shareholding, so a few not-insignificant investors appear to have joined the protest of late. I cannot be 100% sure what is happening behind the scenes here, but I attended the 2014 AGM and it was very clear certain members of the wider Sinclair family do not get along with each other. In particular, Graham Murphy — whose wife Margaret Murphy is the sister of MTVW’s chief exec Duncan Sinclair — was quite vocal with his criticism of how MTVW was managed. I understand Mr Murphy has continued to lambast the board at subsequent AGMs. I get the strong impression the Murphy family want to exit their investment — either through a trade sale or by forcing MTVW to sell its entire property estate and then return the proceeds to shareholders. At the very least, I guess the Murphy family — with a disclosable 18% shareholding — wish to have a non-executive position on the board for themselves. Owning 4% of the shares, the Talisman Dynamic Master Fund — controlled by the William Pears group — is the only other notifiable holder with a potential dissident motive. Every other disclosable shareholder is part of the Sinclair family’s 52% concert party. 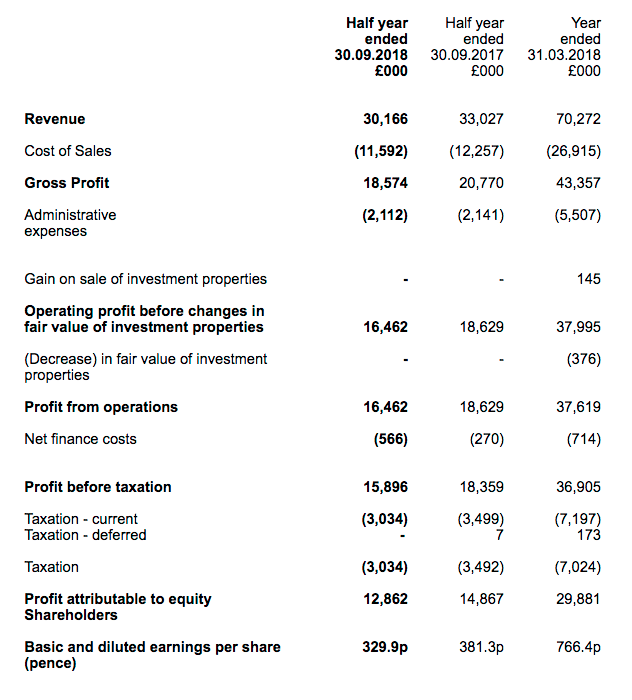 After fine-tuning my sums, I continue to believe MTVW could be worth more than £200 per share — assuming all of the group’s regulated tenancies were to end immediately and the properties could then all be sold at a fair market value. If you recall, MTVW employed property agents Allsop to undertake a formal valuation of the firm’s estate during September 2014. Back then, the book value of MTVW’s properties was £318m and Allsop’s valuation — with the regulated tenancies still in place — was deemed to be £666m. As such, the ‘Allsop-to-book’ multiple was £666m / £318m = 2.10x. I have taken the original September 2014 portfolio value of £318m and subtracted the book value of properties sold since that date. I have then multiplied the £237m remainder by my Allsop-to-book multiple and then by my sold-to-Allsop multiple. I arrive at a £704m estimated current value for all of MTVW’s properties that were owned at September 2014 but have yet to be sold. Since September 2014, MTVW has spent £142m buying additional properties. I have assumed all of these can be sold one day for £201m based on my sold-to-Allsop multiple. Adding the £704m and the £201m together gives me £905m. These sums are not perfect, but I would like to think they are quite reasonable. Of course, the major question remains how long MTVW will take to sell all of its properties to realise my potential £202 per share NAV guess. I trust the longer it takes, the higher house prices will rise and the greater proceeds MTVW will achieve from its future sales. In other words, that aforementioned 1.43x sold-to-Allsop multiplier should increase over time. The following SharePad charts display MTVW’s more immediate valuation. 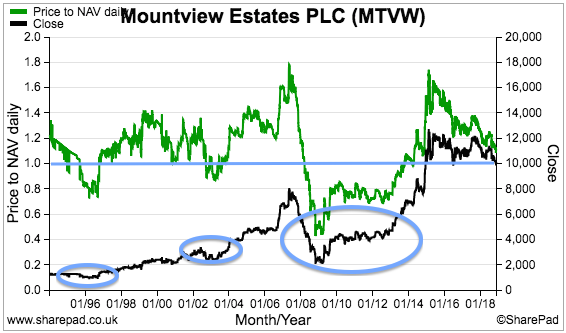 The chart below shows the share price (the black line) at £100 and the price to NAV (the green line) at 1.08x. On an income basis, this H1 saw a maintained dividend and the trailing 400p per share payout presently supports a 4% yield. Anyway, my sums and charts prompted me last month to increase my MTVW holding by 10%. I paid £100 a share including all costs. Thanks for posting this and also your Daejan article. I find the graph that indicates the 4% yield most persuasive. As an Aussie I’m going to sit on the fence until the Brexit vote next week just in case there is some (More) market turmoil !